Adam Shanks (No 9) about to score Whitley Bay's first goal against Bishop Auckland. Whitley Bay produced the outstanding Northern League performance of the day as they ended high-flying Bishop Auckland’s long unbeaten home run with an impressive and thoroughly deserved victory at Heritage Park. 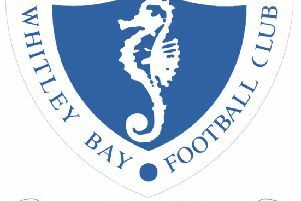 With a squad seriously depleted due to injuries and illness, Bay’s prospects did not look good against second top Bishops. But the players rose to the occasion in tremendous style, none more so than 22-year-old defender Ryan Keltie, brought into the side at short notice for his first appearance of the season. Whitley could hardly have made a better start, taking the lead in the fifth minute. The goal came after Chris McDonald battled his way past two Bishops players near the left touchline and played the ball through to Adam Shanks, who struck a superb curling shot into the top corner from 22 yards. It was his 34th goal of the season and it stung the home side into action. Scott McCarthy proved a threat down the right wing and McDonald did well to stifle the pacy winger, forcing the ball out of play close to the corner flag. With 13 minutes played, Andrew Johnson wasted an excellent chance for the hosts when he volleyed over from close range following a cross by Griffiths. Play was switching from end to end and two minutes later Aiden Haley, back in the Bay side following suspension, went past a defender as he cut in close to the byline, but keeper Wilczynski made the save. The game was being played at a rapid pace and once again McCarthy burst clear down the right as Bishops strove to level the score. Orritt then joined the attack and from his cross Johnson, the league’s joint top scorer, again volleyed high over the bar. The home side’s pressure was rewarded with an equaliser in the 23rd minute and it was another top quality goal. Griffiths received the ball in space midway inside the Whitley half and struck a powerful 25-yard shot into the corner, giving Tom Flynn no chance. The home fans were now expecting their in-form side to take control, but that did not materialise as Whitley held their own and regained the lead ten minutes before the interval. The goal came in somewhat fortuitous circumstances when Haley broke down the right and crossed the ball low into the goalmouth. A lack of communication in the Bishops’ defence as Shanks raced into the six-yard box saw Wilczynski leave the ball and Arjun Purewal sliced it into his own net. It completed an unusual and unwanted double for the Auckland captain, who also scored an own goal when the sides met at Hillheads back in September. Bishops quickly responded and within 60 seconds Woodhouse had a goalbound effort deflected over the bar. With half-time approaching, Callum Anderson made a crucial and well timed tackle to deny Johnson a clear run on goal and ensure that Whitley retained their lead at the interval after what had been an entertaining first half. The expectation was that the home side would step up their efforts in the second half and put the Bay defence under real pressure, but such was the effectiveness of the central pairing of Richard Flynn and Keltie, neither Johnson or strike partner Ian Ward were able to test Bay keeper Flynn. Jake Fowler was later praised by Ian Chandler for his hard work in breaking down opposition play in midfield, and the tactical ploy of using Shanks in more of a midfield role nullified the threat from McCarthy. Indeed, Shanks breaking through from midfield posed a real threat on several occasions, and he might have extended the lead after 58 minutes, but in trying to place his shot beyond the keeper, the attempt lacked pace and was comfortably saved. Callum Patton repeatedly threatened to break through the Bishops rearguard, but with 20 minutes remaining he tried a different approach and it worked to perfection. Collecting the ball from a long throw on the Bay left, and with his back to goal, he swivelled and struck a first time shot into the top corner. It was a stunning goal which took the home defence by surprise and delighted the large contingent of travelling fans, and also brought applause from the home supporters. Almost immediately, Johnson drove a shot across goal and narrowly beyond the far post, but three minutes later, Shanks robbed Purewal as the Bishops captain dallied with the ball on the edge of the box and only the feet of Wilczynski denied Whitley a fourth. Eight minutes from time Shanks again threatened as he raced through a tiring home defence, but his shot was blocked. Although Hoganson brought a fine diving save from Flynn in stoppage time, there was to be no way back for Bishop Auckland and their 13-match unbeaten league run at Heritage Park, which stretched back as far as August, was finally ended. The victory gave Whitley a notable double over the Two Blues, and with the teams around them all losing, it lifted Ian Chandler’s side three places up the table. Whitley Bay: T Flynn, Munro (Ivanov 74), McDonald, Anderson, R Flynn, Berry (Prosser 58), Haley, Fowler, Shanks, Patton (Gladstone 90), Keltie.